The 828E Fitness Cycle has a new softer design, a completely housed flywheel and strengthened frame. A new electronic instrument shows effective output in watts and heart rate using telemetry. 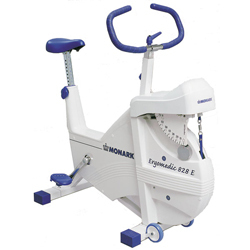 The Monark pendulum balance ergometer is the most used test cycle for fitness testing at work. Electronic meter that shows pedal turns per minute (RPM), heart rate in beats per minute (HR), cycling time in minutes and seconds (TIME), intended cycling speed in km/miles per hour (SPEED) plus distance covered in km/miles (DISTANCE). In addition, braking power can be set, giving a reading of calorie consumption (CAL) and power in watts (WATT). The pendulum balance is easy to calibrate. Braking of the wheel takes place mechanically via a belt that runs around the rim of the wheel. The two ends of the belt are attached to a revolving drum to which a pendulum is fixed. This arrangement works as a pendulum balance, which measures the difference in pulling power on the two ends of the belt.